Received: July 13, 2017; Published online: December 21, 2016. Many intrinsically unstructured/unfolded proteins (IUPs) contain transient local secondary structures even though they are “unstructured” in a tertiary sense. These local secondary structures are named “pre-structured motifs (PreSMos)” and in fact are the specificity determinants for IUP-target binding, i.e., the active sites in IUPs. Using high-resolution NMR we have delineated a PreSMo active site in the intrinsically unfolded mid-domain (residues 201–300) of SUMO-specific protease 4 (SUSP4). This 29-residue motif which we termed a p53 rescue motif can protect p53 from mdm2 quenching by binding to the p53-helix binding pocket in mdm2(3–109). Our work demonstrates that the PreSMo approach is quite effective in providing a structural rationale for interactions of p53-mdm2-SUSP4 and opens a novel avenue for designing mdm2-inhibiting anticancer compounds. With its tumor-suppressive activity, p53 has gotten a cognomen, “the guardian of genome”, and perhaps is the most well-known protein in cancer-related fields. Peculiarly, the transactivation domain (TAD) of p53 is “unstructured”, i.e., does not form a globular structure, which is rather unusual for a 73-residue long domain. To be more precise, p53 TAD should be described as being intrinsically unfolded, not simply “unstructured”, since it contains transient local secondary structures although its overall topology is ill-defined being devoid of a spatially unique three-dimensional structure. When one considers only a structural aspect, p53 TAD resembles a pre-molten globule which is inactive in a functional sense. A rather astonishing fact is that the intrinsically unfolded p53 TAD and in fact many other TFs or TADs resembling a pre-molten globule exist in such a structural state under non-denaturing conditions (~pH7, PBS, room temperature etc), and hence are functional. These unorthodox proteins or long protein regions (the word “region” is used instead of “domain” since the latter tends to insinuate presence of a globular structure) that are functional without a 3-D structure are now termed intrinsically unfolded/unstructured proteins (IUPs) or intrinsically disordered proteins (IDPs), and defy the golden structure-function paradigm in protein science. The transient local secondary structures, recently coined as pre-structured motifs (acronymed as a “PreSMo”), are in fact observed in dozens of IUPs/IDPs including several viral or neurodegenerative IUPs/IDPs and are the key determinants within the flexible IUPs/IDPs for target-binding. Presence of PreSMos in IUPs/IDPs elegantly argues that the target-binding of IUPs/IDPs is mediated by specific motifs, not by the unfolded nature per se of IUPs/IDPs. Table 1 provides a few examples of PreSMos. 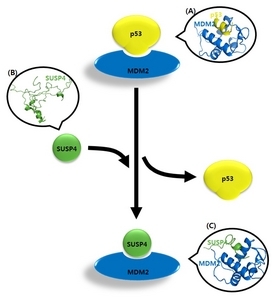 SUSP4 is a mouse homolog of SENP2 that promotes mdm2 self-ubiquitination by removing SUMO-1 from mdm2, resulting in restoration of the transcriptional activity of p53 from mdm2 attack. An earlier study showed that the mid-domain (residues 201–300) of SUSP4 binds to the N-terminal globular domain of mdm2 (residues 1–150) that contains the p53 binding interface. Protein disorder prediction algorithms reveal that the N-terminal 300 residues of SUSP4 are intrinsically unfolded including the (201–300) region that binds mdm2. Using heteronuclear multidimensional NMR and other biophysical techniques we have determined the mechanism of p53 rescue by SUSP4 the intrinsically disordered 100-residue mid-domain of SUSP4 contains a pre-structured “p53 rescue motif” (Diagram 1). This work was supported by an NST grant (NTC2251422) and a grant from the R&D program for cancer control, Ministry of Health and Welfare, Republic of Korea (1320190) to K.H. Fig. 1. A scheme describing p53 rescue by the p53 rescue motif found in the intrinsically unfolded SUSP4. (A) The helix PreSMo in p53 TAD (yellow) is bound by mdm2 (blue). This PreSMo is depicted as a bulge at the bottom of p53 in the top cartoon. (B) An ensemble representation of the disordered SUSP4 29-mer PreSMo (termed “p53 rescue motif”) populated with a helix (green). (C) The p53 rescue motif of SUSP4 (green) has replaced the p53 helix and is bound to mdm2. aThe numbers indicate the total number of amino acid residues in IUPs/IDPs and those in parenthesis are the sequential residue numbers. bThe symbols H, T, β and PPII denote helix, turn, β-strand, and polyproline II helix, respectively. No symbol is given when the nature of the secondary structure is not described in the original report. cThe population is obtained from NMR chemical shifts using the SSP (secondary structure propensity) calculation algorithm of Marsh et al., (2006).